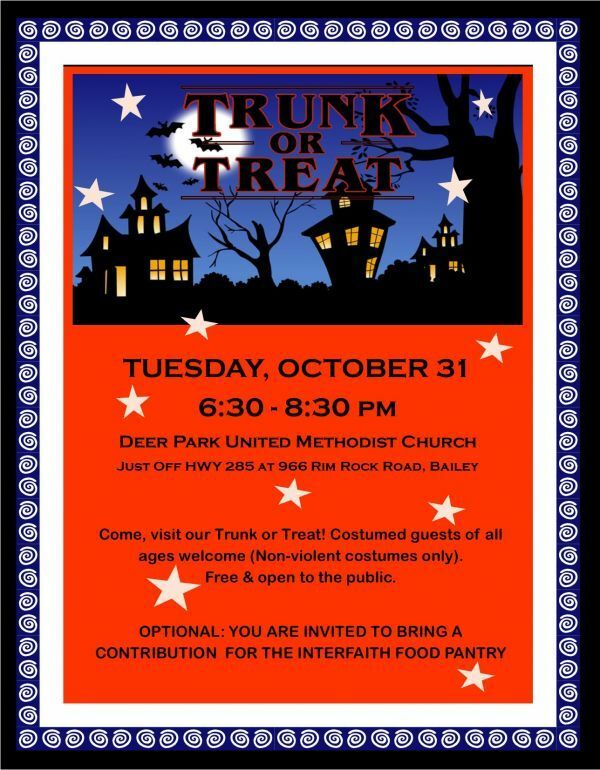 Please join us for Halloween fun on October 31, 6:30-8:30 p.m. Children, youth and families are invited to Deer Park United Methodist’s First Annual Trunk or Treat Halloween party. Come in costume and bring your friends to experience a fun and magical Halloween event. The party is geared toward fun and entertainment (rather than fear and gore). In celebration of the Interfaith Food Pantry’s recent refurbishment, you are invited (not required) to bring a donation for the Pantry. The event is at Deer Park United Methodist, just off Highway 285 at 966 Rock Ridge Road, Bailey (1.5 miles up 285 from Pine Junction). Park in lower lot, party is up the stairs. Disability parking available. All ages welcome. Non-violent and wholesome costumes only. You are welcome!